Leave it to my down-to-earth, liberal, funky hometown to come up with the brilliant idea of a vegan soul food restaurant (LA, please follow suit!). 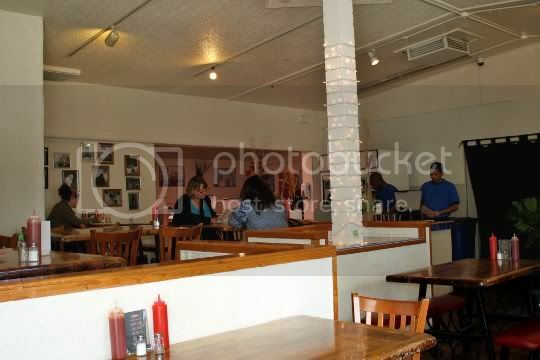 On a corner of Downtown Oakland near Jack London Square sits the surprisingly large and busy Souley Vegan, which has garnered popularity over the years since their move from a much smaller location. And for good reason: this place is awesome! The restaurant itself is non-descript. The lighting is dim, crooked blues and jazz photos and posters cover the walls, and the mishmosh of seating looks like something out of the back room of a church. The place lacks any kind of intimacy, coziness, or quirk (something I'd kinda expect from a place serving vegan soul food), and is, dare I say, a bit shabby. But really, who cares about all that when the food (and staff) are out of this world?! First-time diners at Souley Vegan must, must, must get the Everything Plate. This is not up for debate, just do it! Yes, it seems like a lot of money, but believe me when I say two to three people can go to town on this and STILL go home with a couple days' worth of leftovers. Basically, you get a little of each one of the staple menu items; for only $2 more, you can add an additional item, which is the size of a meal itself. 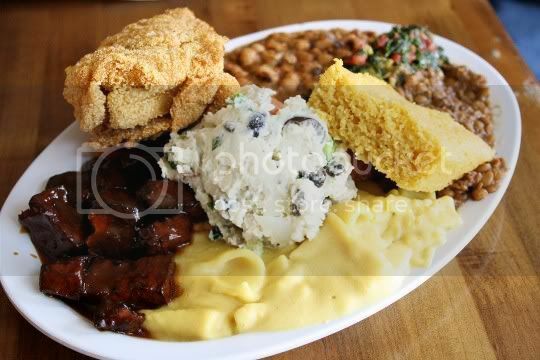 For $25, you can get the Everything Plate with a side of rice and beans and huge plate of fried okra (well worth it!). These weren't really your typical soul food greens; actually, they tasted more Italian. Finely minced and mixed with onions and tomato, they're tangy, salty, and super garlicky. There's a melange of herbs and spices, and they're so delicious that they'll be gone in a few bites! I've never really understood why some people hate black-eyed peas. They have a delicious savory, earthy flavor, and Souley Vegan adds some tang and pungence by stewing them together with tomatoes and onions. The same spice combination is used here that's used in the greens, red beans and rice, and lentils, except these have some nice heat. Although slightly bland, this cornbread definitely has that down home feeling. It's sweet and dense, and the thick piece is great for sopping up the sauces of everything else on the plate. These seem to be seasoned and flavored very similarly to the black-eyed peas (minus the heat), except they add that delicious meatiness that only comes from lentils. If you're a person who doesn't like black-eyed peas, you'll probably love these. But it's really a toss up (they're both delicious!). I've had some good candied yams (both from my own kitchen and others'), but these are probably some of the best I've ever had. The added sweetness comes from agave syrup and raw sugar, which somehow gives the yams a delicious rich caramelized, almost molasses-like flavor. They're also perfectly cooked, combining the soft (but still firm) texture of whole pieces along with a sort of juicy, syrupy yam slurry. So aside from my disdain for black olives, this potato salad was great. 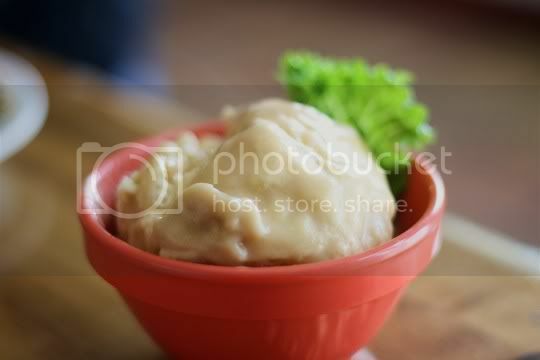 The perfect blend of chunky potato pieces and smooth "mash," it's creamy, light, and mildly seasoned. I suppose the olives are there to add most of the saltiness, but I picked most of mine out and it was still delicious. If you're into the nutritional yeast-based cheese sauces (aka "nooch"), then you'll love this version of mac and cheese. The flat and wide slightly overcooked semolina tubes are covered in every nook and cranny with the creamy, rich, savory sauce. I thought it could use a little more seasoning, but the nooch flavor is powerful and provides a nutty, yeasty tone. 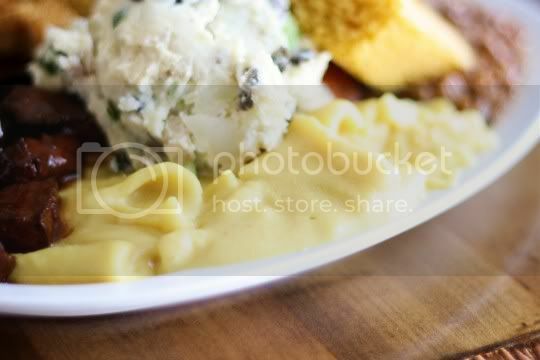 The texture of the cheese sauce is smooth and creamy. In fact, I think they've greatly improved on this dish since the first time I ate at Souley when they first opened. Almost looks like a big piece of fried chicken, right? Well, it's really just a slab of tofu battered and breaded like no one's business, then fried until crisp and crunchy. The cornmeal breading is well seasoned and flavorful; the tofu underneath, unfortunately, is not. Taking a big bite of both is absolutely delicious, but there's definitely way more breading than tofu. Not that that's a bad thing. Just be prepared to be eating some super thick pieces of nothing but the breading. In fact, I wonder how they get so much breading in places that don't even include any tofu; this stuff must be dipped and battered to death! All that aside, douse the stuff with hot sauce, and you'll definitely feel like you're grubbing down on the real thing. Hands down. Stop the presses. Well slap my mama and call me Sally. This is BY FAR the BEST thing on the plate, maybe even at the restaurant. The tofu isn't just bathed in some of the most amazing barbecue sauce you'll probably ever taste, but it's actually cooked, so it's firm, chewy, and charred. The sauce is thin and slightly syrupy, tangy and sweet, and so full of flavor you may want to lick your plate clean. Or at least dip everything else in it, like I did. Another common soul food item you either love or hate. I still haven't quite made up my mind, but the okra at Souley is definitely a step in the right direction. Although the pieces still contain that weird slimy okra thing, it's definitely tolerable in bite-sized pieces. The cornmeal-based breading is a lighter, thinner version of what's used on the fried tofu, and the crunchiness and crispness is done quite well (even if some of it falls off). 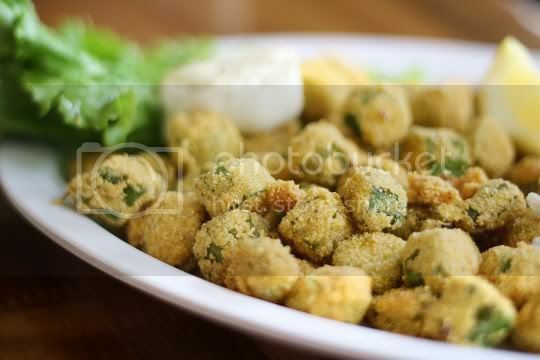 The dipping sauce is a rich and creamy Vegenaise-y concoction, and takes the okra to new levels. Add some hot sauce, and this okra could easily change your mind if you think you're not a fan. 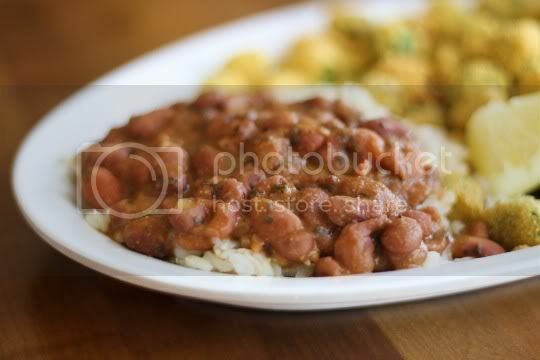 This side is flavored the same as the lentils and black-eyed peas, but they have that delicious mild creaminess and texture from old-fashioned red beans and rice. In fact, this might be the best dish that the common seasoning is applied to. The rice is a bit al dente, but there's enough of the herb-heavy, gravy-like sauce to drench it. Biscuits and gravy massiveness here. 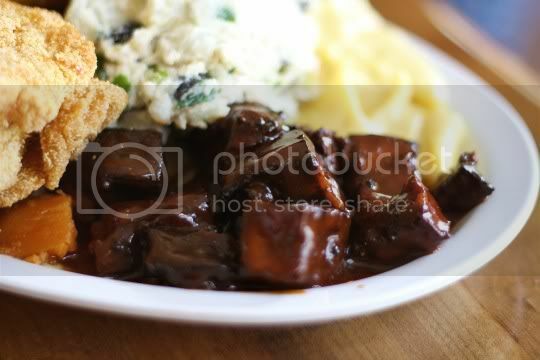 The biscuits are huge and hearty, although a little dry. Covered with a salty creamy gravy (which tastes just a little too floury), this dish is not for the faint of heart. Seriously, you take about three bites and you're stuffed. But don't worry, it provides great breakfast leftovers, especially with a little added maple syrup! 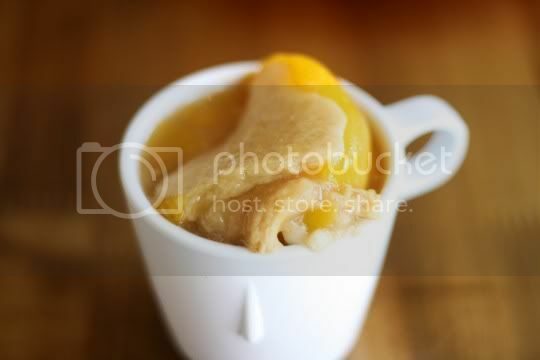 What soul food meal wouldn't be complete without a dessert of peach cobbler? Of course Souley has it, and it's absolutely delicious! Seriously, I think any omni wouldn't even know the difference. The peaches are juicy, the sauce is perfectly sweetened and spiced, and the cobbler pieces are strewn throughout in just the right amount. Personally, I would prefer thicker cobbler pieces, but overall the dessert was just divine. The perfect way to end the meal! 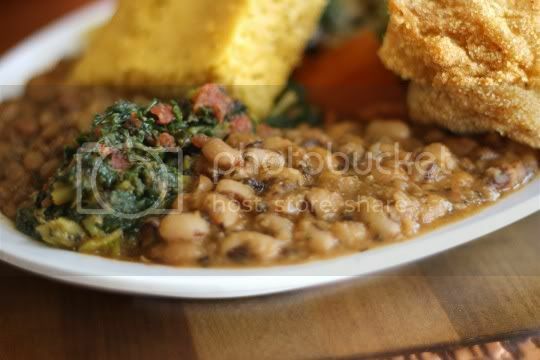 Not only do I love the concept of vegan soul food, I love that Souley Vegan executes it so well. 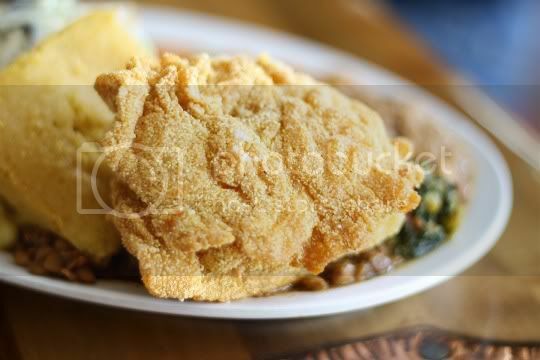 They don't take any shortcuts with flavor or consistency, really staying true to the soul food feel. 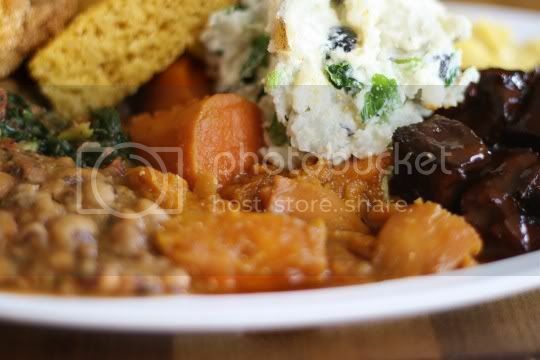 Portions are massive and hearty, and while yes everything is vegan, it by no means tastes "healthy"...which is what you'd better be going for if you're eating this Southern cuisine. They also have burgers, available with either the Southern Fried Tofu, BBQ Tofu (drool...), or a portobello mushroom (if you are going the healthy route, I suppose). Souley also seems to keep expanding their menu, offering new items such as Sweet and Sour Tofu and Gumbo (OMG!). Oh, and they also serve weekend brunch! So if you're in the Bay Area and want to try something that will truly blow your mind, get over to Souley Vegan ASAP! Went there almost a year ago now (we don't get out much) and it ROCKED!!!! Awesome food, really nice people - can't wait until we get another night out. 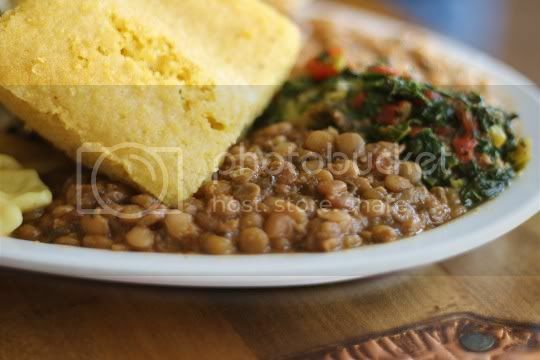 FYI...L.A. has at least 3 vegan soul food places: 1. 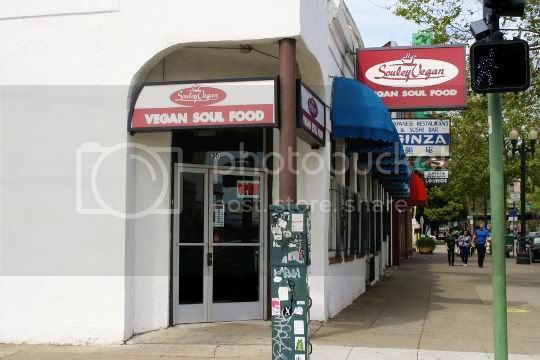 Veggie Soul near USC, Vegan Internet Cafe on Olympic and Crenshaw, and Stuff I Eat on Queen and Market in Inglewood. Good eats. I think Veggie Soul and Vegan Internet Cafe are closed... Never been to Stuff I Eat though, I've heard great things! This place rocks! I had the fried okra appetizer and spaghetti meal. It was VeganSoulicious! Keep up the great work!